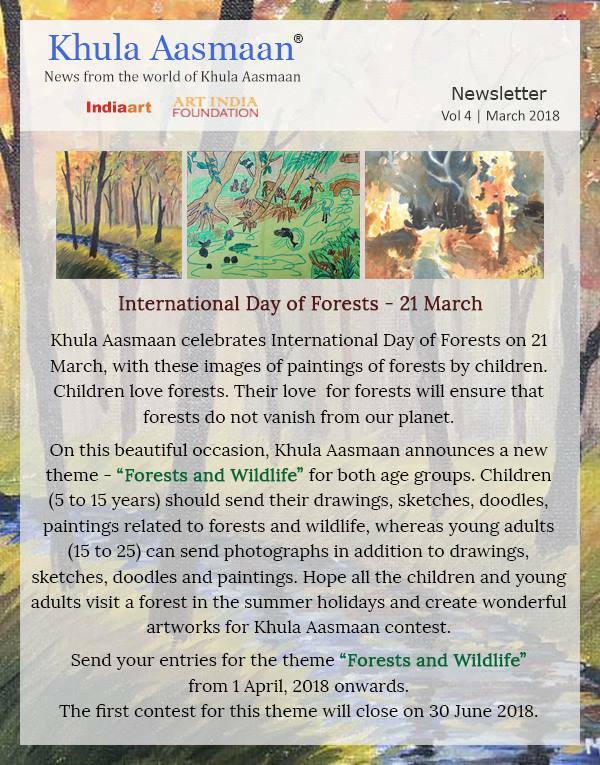 Khula Aasmaan International Day of Forests Online Art Contest. Khula Aasmaan celebrates International Day of Forests by announcing a new theme for the contest – “Forests and Wildlife”. Do sketches, drawings, doodles, paintings, shoot photos. For children & young adults. Submit your entries online from 1 April onwards. The participants whose artworks get shortlisted, will get an opportunity to have a dedicated web page for themselves. The shortlisted children and young adults will be able to submit their new creations, which will be published on their dedicated web page for a period of 3 years. Medal winners and Honorable mentions will be selected from among the shortlisted artworks received.